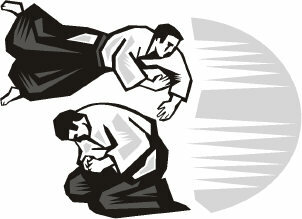 Aikido Breakfalls suggest what they are named for, breaking the force of your fall to the ground without injury. On the other hand, ukemi is the ability to receive a technique or fall safely and recover your balance. Learning how to develop good ukemi is difficult. Many Aikidoka only focus on this skill in a limited way, as their main focus is on becoming a good performer of technique. One of the main reasons for this is that people in the West are generally highly competitive. We have been taught to put ourselves first... winning is better than losing. This means that we tend to concentrate more on performing Aikido techniques, and winning, rather than receiving Aikido breakfalls and losing (gracefully). This way of thinking is rather egotistical and selfish, and Aikido training addresses this problem directly. In order to take we must give, and vice versa. So by focusing more on helping our training partner, we will help ourselves. In my many travels of Aikido dojo, I have found hundreds of students that have a reasonable level of technique. But, most dojo only have a few good uke, that can be used for demonstrations. This is because the goal of most students is to win and perform well. YOU can truly excel at the art by looking more closely at Aikido breakfalls and good quality ukemi practise. By working on breakfalls, you can develop greater confidence. This will allow you to be of use to your training partner, by not resisting their techniques. This helps them develop their skills and yours must faster, its a win-win situation, that removes the conflict from the connection. Resisting more and pressure testing techniques should be done at a much later stage in training. I would suggest brown and black belt level. Aikido Success Blueprint offers you Key Action Steps for fast results! They are first learned by lying down flat on your back on the tatami mat. First bend your knees, so your heels are flat on the floor, with arms held palm-down at 45 degrees from your body. Lift your head, with your chin touching your chest. This strengthens your neck muscles, and protects your head from hitting the ground if you fall. From a sitting position, just roll back, making sure your chin is tucked well in and exhale strongly. Slap the ground, and repeat several times. Then try from a squatting position with your buttocks sitting on your heels. Tuck in your chin and curve your spine, and allow your body to roll backwards so your back hits the floor. You should force your breath out sharply, and slap the mat just as you touch it, repeat several times. Practise this until you can do it without jarring your body, with no feeling of shock. Eventually you can try it from a standing position. Stand up straight, bend your knees and lower your buttocks close to the ground, and place one foot slightly behind the other. Roll onto your back, and continue as before. You should already be able to perform back breakfalls before you try to learn side breakfalls, which are just one-armed, one-sided back breakfalls. You would fall on your side if the person throwing you is still hanging on to one of your arms, that he used to break your balance and make you fall down. If you are doing it on a nice dojo mat, you'll slap the ground with your hand. If in the street or on concrete, you might keep your free arm on your stomach as you fall, to prevent it getting damaged, and leaves the arm ready to protect your face from a blow. Remember, if you slap, your arm should be at about 45 degrees from your body when it hits the mat. Immediately after, you should withdraw your arm to protect your chest or face to block a punch or kick. Practise by lying flat on your back, lift your head and shoulders off the mat and curve your back as you rock back on your curved spine, and raise your legs high into the air. Then drop your legs to your right side, and slap the ground with your right arm palm down at 45 degrees. Your right hip, knee and the whole side of your right leg and calf should be flat on the mat. Your left leg should be bent at the knee, with your left foot flat on the ground. Correct your side Aikido breakfalls posture, making sure your chin is fixed to your chest. Then sit/rock backwards and raise your legs into the air again, straight up. Then come down on your left side. Again, check your ukemi ... left hip, knee and the whole side of your left leg and calf should be flat on the mat. Your right leg should be bent at the knee, with your right foot flat on the ground. Do side breakfalls to your right, left, etc. until you have done them several times on each side. 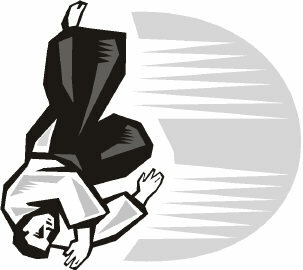 Rolling Breakfalls are sometimes called Forward Rolls in other martial arts. Ukemi is the Japanese word for the art of falling safely, and gymnasts call it tumbling. It's all about not getting hurt when you fall down. Forward Rolls are very important because they get you back up onto your feet immediately, so you can continue defending yourself. Before you try Rolling Breakfalls, you should already know Back and Side Breakfalls. Rolling breakfalls are impressive to watch, especially during a demonstration. But they take considerable practice. When your body falls at speed, you need to protect your head and neck, spread the shock and save your arms and legs. You accomplish this by making your body into a circle, where your body rolls. The energy is absorbed along the perimeter of the circle, and nothing gets damaged. Practise on tatami mats. Think of your shoulders, arms and hands as a hoop or a circle. Roll along your extended hand and arm, shoulder, the center of your back, your spine, buttocks, legs and feet. You must train your body so it touches the ground all along this pathway each time you do a rolling fall. Kote-gaeshi Aikido breakfalls are how you escape from a very nasty arm break in Aikido or Ju Jitsu. If you don't know how to leap over your own arm quickly, and land with a good side breakfall, your arm may snap when someone hits you with a Kotegaeshi throw at full power. The Kote-gaeshi breakfall is not for Aikido beginners, and you need to build up your Ukemi skills before you try this. You would start learning Kote-gaeshi breakfalls by practising with a partner in the dojo. The first few times, the assisting partner holds your hand lightly, turns and kneels as he places your hand palm-down on the mat. This makes it safer for you to do a gentle rolling breakfall over your captured arm. Once you get you used to timing your breakfall to the actions of someone else, you can then practice increasing the power of the move until you are actually being thrown into the breakfall. The variety of falling from ukemi in most Aikido breakfalls allows for the angular throws to allow for rolling rather than dumping you partner. Unlike the gentler angles of Aikido, the uncontrolled falling that sometimes is found in many harder styles can cause injury over time, even if the fall is interrupted or broken by correct breakfalls the force can overcome the level of safety. In meeting the mat try to distribute as much force throughout your body as possible in the most relaxed manner. It takes a lot of practice to achieve the correct timing, and allow your body to distribute the force.